Golf lovers know what it’s like, having to deal with the back pain associated with the game. If you are noticing some pain around your lower back area, it means that the game is beginning to tell on you. It might even start to affect your performance when playing, or prevent you from getting back to playing golf. To ease the pain you are feeling so you can get back to the game, this article will guide you on the things you need to do to reduce the back pain. Is golf the reason for the pain? When you play golf, you are involved in a lot of physical activity. 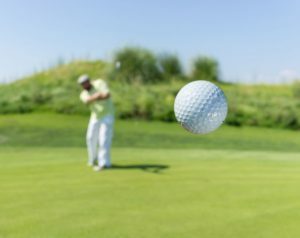 For instance, by merely bending down to pick up the golf ball, or throwing your hand back to get a good swing, all these actions do not actually cause the back pain. Instead, it helps you keep fit. Golfing is a part of exercising and a stress reliever. Now, the question is, what is actually causing the pain? To be able to determine what is causing the back pain, one needs to bear in mind that there could be an underlying issue, that is the reason for the back pain you feel. To swing the club when playing golf requires that the player should have some strength, and should be flexible. Actually, back pain can also come up if you are a professional golfer, who plays almost every day, but this rarely happens. What causes the back pain could be as a result of muscle problems, weight gain and a weak lower back. Golfers will experience pain in their lower back area, upper back pain, neck pain, back spasms etc. People who do not do exercises on a regular basis, or even stretch, are likely to develop tight muscles. These tight muscles can be seen at the front or back of the legs and will cause pressure on the spine, which in turn results in the back pain. The surprising fact about this issue is that with only good stretching exercises or work out routine, you will notice an improvement on how you feel. There are a lot of recommendations when it comes to exercises for golfers, but it is also essential to know which one will work for you. Doing workouts that identify with your particular needs, will have better results than just trying out random exercises. By treating the real cause of the pain, which could be weight gain or muscle imbalance, it will help you quickly heal, and get back to playing golf. If you feel particularly sore all over your body, you can also use over the counter topical pain creams for relief. It is not advisable to ignore the back pain, which may cause more severe complications. When you begin to notice the pain, it is time for you to pay more attention to your health and well-being. The most common injuries experienced by golfers is back pain, and even professional players are not exempt. They are often affected by conditions like back spasms and herniated disc pain. Get into a good workout programme that will help you maintain flexibility, and loosen up your muscles. Act quickly to treat the pain you feel, so you don’t end up leaving the game you love, in the long run.